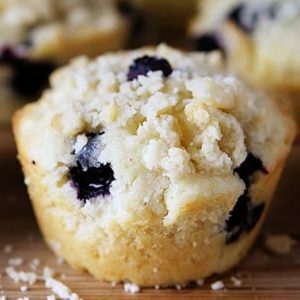 I have quite a few blueberry muffin recipes on my blog. Blueberry Cream Cheese Muffins and Blueberry Breakfast Cake and Blueberry Banana Banana Bread with Brown Butter Glaze. Preheat oven to 350°F. Spray or butter a cast iron skillet. Combine the flour, sugar, and salt in the bowl of a stand mixer fitted with the paddle attachment and paddle on low speed until well mixed. Add the butter and water and paddle on low speed until the mixture starts to come together in small clusters. Spread the clusters in skillet. Bake for 10 minutes. When done the crumbs should still be a little moist to the touch; they will dry and harden as they cool. Let the crumbs cool at least five minutes before adding to muffins. Mix sugar and eggs together in a stand mixer until combined, about 45 seconds. Add in butter, buttermilk and vanilla and mix until just combined. Remove bowl from mixer and fold in the flour mixture. Once mostly combined, gently add the blueberries into batter. Use ice cream scoop or large spoon to divide batter equally among prepared muffin cups (approximately 1/4 heaping cup batter). Sprinkle top of muffins with pie crust crumble, about a teaspoon per muffin. Bake until muffin tops are golden and just firm, 17 to 19 minutes.